In 1 1/2-quart saucepan, heat broth to boiling. Stir in bulgur, dill weed and garlic salt. Reduce heat to low; cover and simmer 20 to 25 minutes or until bulgur is tender. Remove from heat. Meanwhile, spray 10-inch skillet with cooking spray; heat over medium-high heat. Add chicken; cook about 4 minutes, stirring frequently, until no longer pink in center. Remove chicken from skillet; keep warm. Add oil to skillet; rotate skillet to coat with oil. 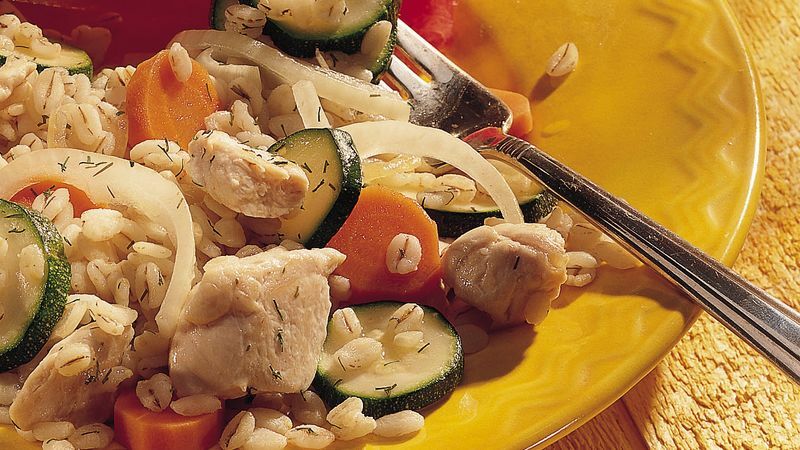 Add zucchini and onion; cook about 4 to 5 minutes, stirring frequently, until vegetables are crisp-tender. Stir in chicken. Toss with cooked bulgur. Bulgur wheat is a great grain to serve for a weeknight dinner because it cooks in only 20 minutes.